This is how I chose to cook a Shoulder of Lamb the other day. Having earned my AGA ‘brownie points’ by working in the AGA shop that used to exist in Beverley some years ago (and been lucky enough to acquire my AGA with Staff Discount) this is one dish I had always wanted to cook in my AGA oven, but somehow it had eluded me until now. My Slow Roasted Shoulder of Lamb recipe is like so many I cook at the moment – a bit from here, a bit from there and then an ingredient I think I remember some chef mentioning, maybe? It isn’t that I don’t follow cookbook recipes – Heavens, you must have seen my overflowing library of cookbooks collected over the years, pictured in earlier blogs. And I still devour recipes, but once I am familiar with the general method, I can’t help messing about a bit, sort of putting my own stamp on it. The excitement at preparing the Shoulder of Lamb for it’s very slow roasting was somewhat tempered by the fact that I had just recovered from a horrific bad throat and cold, but now poor Erik was showing visible signs of collapsing with the same winter ailment. Anyway, we decided it was either ‘kill or cure’, and we both wanted to see if it would turn out well. So smothered with my favourite Lamb seasoning of the moment, Ras al Hanout, the Lamb shoulder was browned all over. Meanwhile onions were chopped into sixths, bayleaves were inserted in between, along with rosemary sprigs and thyme and garlic cloves (some impaled into the skin and some placed into the pot). The Lamb was esconced on top of the onions, then Vermouth and chicken stock poured over and all was brought to a simmer. With my AGA, I have a Simmering Oven, and as I prepared the Lamb mid-morning, but we were not eating until 7.00pm., I put the lid on my heavy pot, and placed it in the Simmering Oven (equivalent to about 130 C) for the next 6 hours. 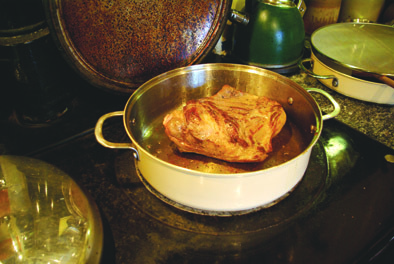 After that time, and with trepidation, I managed to lift the pot out, placed it on the AGA warming plate, took the lid off and after nearly fainting with pleasure at the fantastic aroma that wafted up from the lamb, I poured some runny honey over the skin. The Lamb, uncovered, went into the top of the Baking Oven (roughly 180 C), for about 30 minutes, until the skin was golden-crispy brown. Then the fragrant pot came out, the Lamb was put into another dish to rest whilst I finished off the rest of the meal. Chantenay Carrots roasted in oil and herbs in the oven, and Jansson’s Temptation, that fabulous but rich Potato, Onion, Anchovy and Cream gratin- type concoction. Shredding the Lamb was a bit like shredding Crispy Duck, but I must admit we kept pinching little pieces of the meat. It tasted gorgeous, and I will definitely add this dish to my repertoire for family and friends. The Jansson’s Temptation was stunning as well, but so rich that a big spoonful each was enough for us. Jansson’s Temptation – Rich and Creamy, but don’t overdue the Anchovies! I do find it incredible that after having had many food adventures, both Erik and myself still get excited at cooking something new. Whether it’s a recipe from Gordon Ramsay, Nigel Slater, Jotam Ottolenghi, an old one from Elizabeth David or our grannie’s recipe book, the excitement never ends. In fact, as we have more time on our hands, we cook more and more, and love sharing our discoveries with everyone. If you would like up-to-date information on AGA ovens (including the Total Control new AGA that you can turn on and off – even with remote control – that I dream about), please Click Here. If you would like the recipe for the Slow Roasted Shoulder of Lamb please see below. If you would like the Jansson’s Temptation recipe, please click here. Lamb is one of my favourite meats, and cooking this Shoulder of Lamb this way is just so easy. And it is amazing how much tender meat there is to eat - next time I invite family or friends for a meal, this is definitely one meal I will be happy to cook for them. So do have a go at Slow Roasted Shoulder of Lamb - you will love it. Rub seasoning (I love Ras al Hanout) all over Shoulder of Lamb. Heat oil in heavy pan or pot, and cook Lamb until brown all over. If using Conventional Oven, heat to 140 C, 120 C (Fan) or 275 F.
Put Lamb on one side, and then place cut onions on base of pan, sprinkle Rosemary Springs, Thyme, Mint and Bayleaves, 5 garlic cloves on onions. Insert slices of cut garlic cloves and small Rosemary sprigs into slits cut all over the Lamb Shoulder, then place it on top of the onions and herbs. Pour Vermouth or white wine, plus hot chicken stock over Lamb. Place on hob or simmering plate, and bring to a good simmer. Place lid on, making sure it is a very good seal. If not a brilliant seal, place a piece of foil over the pot before adding the lid. If cooking in Conventional Oven, place in when oven up to temperature, and cook for 4 1/2 hours. If using AGA, place in the simmering oven for approx. 6 to 6 1/2 hours. 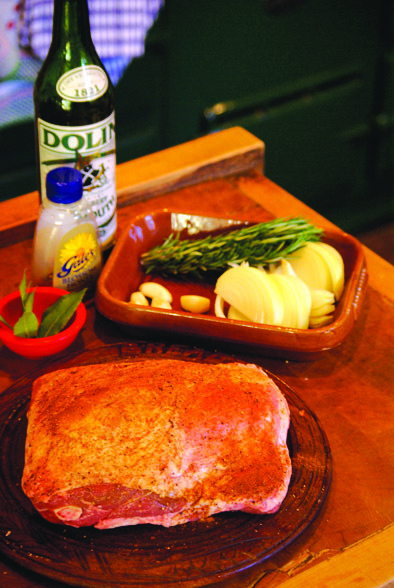 I can guarantee that your house will be filled with the aroma of this Shoulder of Lamb. After cooking for that length of time, take the Lamb out of the oven. Remove the lid and foil, and drizzle the runny honey well over the skin. Increase a Conventional Oven to 180 C, 160 C (Fan) or 350F, then uncovered, place the Lamb in oven for a good half hour, until the skin is golden and crispy. Using the AGA, place the lamb, uncovered, at the top of the Baking Oven for half an hour approx. When the skin is lovely and golden-brown and very crispy in places, take out of oven, put in warm dish, cover loosely and leave to rest for up to half an hour. Take the pan with the onions, herbs and liquid. Carefully spoon any fat off, take any woody stems from the herbs and the bayleaves out, then with a potato masher, gently mash the onions and herbs into the liquid. Warm up on the hob or simmering plate, taste and season if necessary. When ready to serve, get two forks and shred the Shoulder of Lamb - it just falls away, like the Chinese Crispy Duck - and try not to eat it all as you are doing this. It tastes amazing. Just serve big spoonfuls of this Slow Roasted Shoulder of Lamb, splashed with some gravy, and I love it with simple roasted carrots and Jansson's Temptation. * Cooking Time: AGA - 7 hours including resting - Conventional 5 1/2 hours including resting. Thank you, thank you! This recipe is going to save my Sunday! I’m quite new to my Aga and had no major disasters yet (! ); but cooking Sunday dinner for my family, headed up by my Aga perfectionist Mother in Law and critical Farther in Law, leaves me with nightmares over timings and even which rung to use in the different ovens! Your recipes, and all of you blogs, are right up my street; from my little cottage veggie garden, cooking outdoors as much as we can and David Mellor just around the corner. I’ll have to swap the cat or a Jack Russel and Yorkshire for Derbyshire – but nearly there! Thanks again and now I have my favorite new way to while away time at my desk. Glad I could have been of help with the Lamb recipe and the AGA. I used to work for AGA before I was lucky enough to get my own big one (with staff discount – amazing). Quite a lot of my recipes have both AGA and ordinary oven cooking in them. Just put ‘AGA’ in the search space and everything I’ve written will be there. Lucky you to have David Mellor near you – I would love to come and see the shop. My favourite pans, Stainless Steel Eva Trio from Denmark, used to be available from David Mellor. I bought mine when we had a cook shop in Beverley (1987 – 92), then added on a year ago but the original ones I bought in 1998 are still brilliant. Thanks, Astrid – absolutely delicious. No additional cooking time required. I removed the lamb into a shallower dish to brown it in the Baking Oven and used this time to reduce the liquid (having first added more Martini Rosso). Our miniature schnauzer is now enjoying one of the bones on the garden in the evening sunshine (here in Derbyshire – probably quite close to Jess, as we’re just a 10 minute drive from David Mellor!). I loo forward to reading more of your recipes and culinary adventures. Sorry I didn’t get back to you in time Janet – had rather a full weekend with family and friends, cooking loads. Glad the lamb turned out OK. Did the lamb recently (but sadly not in an AGA), and remembered just in time to add runny honey onto the skin for the last half hour. Crisps it up and tasted gorgeous. Lots more cooking and growing our own veg coming up on the blog. Regards Astrid.